Although they're tasty any time of the year, deviled eggs are synonymous with the Easter holiday. 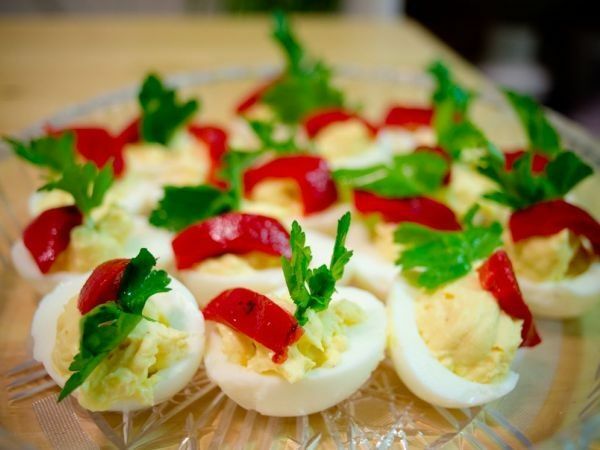 This treasure from the Patch archives offers several twists on the traditional deviled egg recipe to spice up your table this holiday. Start with 10 hard boiled eggs halved for 16-18 deviled eggs. Note: All of the fish, meat, vegetables and herbs should be finely diced. Follow these simple instructions for the perfect, easy-to-peel hard-boiled eggs. Pat your peeled eggs dry with a paper towel. Cut each egg in half and place the yolk in a bowl. Arrange the egg white halves on a tray. You might not use all the egg white halves. Mash the yolks with a fork. For the Smoked Salmon & Capers Deviled Eggs: Add 3 tablespoons of mashed egg yolk to the salmon, diced capers, diced red onion, mascarpone cheese, and mayonnaise to a small bowl. Blend together, mashing the yolk with the other ingredients. Add a shake of salt and pepper. Taste for seasoning. Add a little more mayonnaise if you like your filling more loose. Use a teaspoon to fill four egg white halves with the salmon mixture. Some cooks use a plastic storage or pastry bag to pipe in the filling. Garnish the top of the eggs with few pinches of salmon and capers. Clean your bowl and utensils. Repeat the process with the other varieties, mixing together the egg yolk, meat, vegetable or herbs with the mayonnaise and seasonings. Add salt if needed. Garnish each type with a pinch of its own special ingredients (turkey ham and dill, roasted red pepper and chives, and bacon and jalapeño). Cover the tray of eggs with foil and refrigerate until ready to serve.